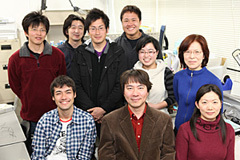 Group of Molecular and Cell Biology | Division of Biological Science, Graduate School of Science, Nagoya University. It has been thought that protein expression and function are controlled at the transcriptional and translational levels or by posttranslational modification, and that protein degradation is a mere refuse disposal mechanism for unnecessary proteins. However, a growing body of evidence has brought to light critical roles for protein degradation in controlling a variety of cellular processes. 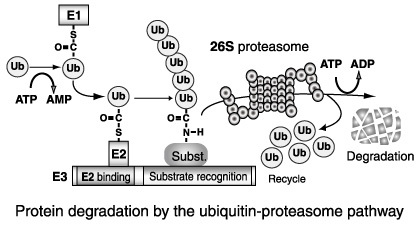 We are studying the ubiquitin-proteasome protein degradation pathway. The conjugation of ubiquitin to target proteins is catalyzed by three types of enzymes, E1s, E2s, and E3s. E3s are responsible for recognizing, specifically binding, and recruiting target proteins for ubiquitylation. E3s fall into three classes: HECT domain proteins, U-box domain proteins, and RING-finger domain proteins. The RING-finger type E3s play important roles in cell cycle control, carcinogenesis, and other pathways. We have focused on the Cullin-type E3s, and have discovered the common component Rbx1 and generated new knowledge regarding Cul2- and Cul5-type E3s. The current purpose of our research is to identify target proteins that are specifically ubiquitylated by these E3s, and to elucidate the biological phenomena controlled by the relationships between E3s and their target proteins. The VHL tumor suppressor gene is mutated in most sporadic clear cell renal carcinomas and in VHL disease, an autosomal dominant familial cancer syndrome that predisposes affected individuals to a variety of tumors. We have been studying the molecular mechanism of VHL disease, and have determined that VHL protein is a subunit of the Cul2-besed E3 ubiquitin ligase, and that it regulates the degradation of hypoxia-inducible factor HIF. We are continuing these studies. In order for cells to proliferate, they must replicate genomic DNA thoroughly and accurately. DNA damage prevents proper DNA replication, but cells overcome this impedance in order to divide. The DNA replication machinery contains various replication fork-associated proteins. We have recently found that a ubiquitin ligase is a part of the DNA replication machinery and is involved in replication of damaged DNA. We hope to understand how this protein is involved in DNA replication by identifying and investigating the proteins that the ligase recognizes and targets for degradation. Eukaryotic cells contain membrane-bound organelles, each of which has distinct functions that contribute to cell viability. 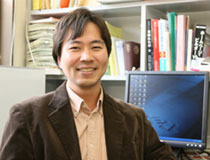 To maintain organelle homeostasis, the quality and quantity of proteins are strictly monitored by a sophisticated protein quality control system. Currently, we are focusing on the endoplasmic reticulum (ER), the earliest organelle in the secretory pathway; we hope to understand how defective proteins in the ER are specifically selected and degraded by the ubiquitin-proteasome pathway in the cytoplasm. Our long-term goal is to clarify how such protein modifiers contribute to the maintenance of organelle homeostasis.